Researchers at Lawrence Berkeley National Lab (Berkeley Lab) and the University of California, Berkeley have combined cutting-edge cryo-electron microscopy (cryo-EM) with computational molecular modeling to produce a near atomic-resolution model of the interaction between microtubules–crucial components of eukaryotic cell ultrastructure–and microtubule-associated proteins called tau. The model provides insight into how tau stabilizes microtubules, and what makes it dissociate to form tau aggregates, or "tangles," in some neurological diseases–including Alzheimer's disease–generally referred to as tauopathies. Microtubules play an important role in maintaining cell shape, enabling some forms of locomotion, facilitating intracellular transport, and segregating chromosomes during mitosis. Each microtubule is a hollow cylinder composed of thirteen parallel protofilaments of tubulin protein. Tau helps keep microtubules stable and organizes them into bundles. Mutations or post-translational modifications, such as hyperphosphorylation, which reduce tau's affinity for microtubules are thought to contribute to the formation of tau tangles. 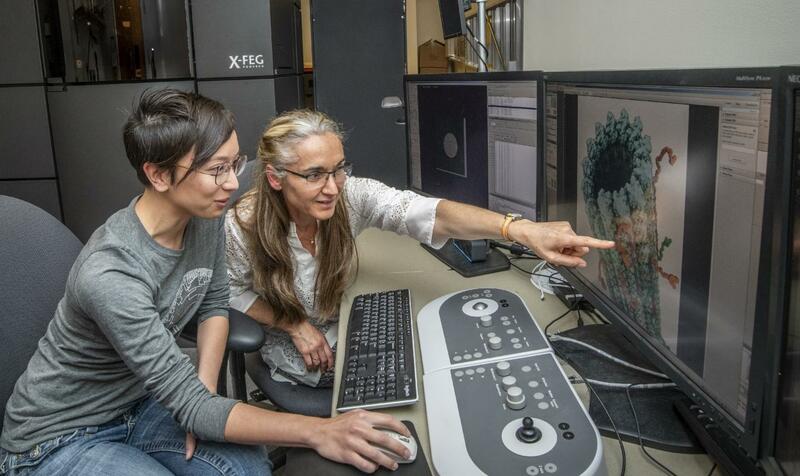 The team, led by Eva Nogales, a senior faculty scientist in the Molecular Biophysics and Integrated Bioimaging (MBIB) Division at Berkeley Lab and a Howard Hughes Medical Institute investigator and professor at UC Berkeley, used cryo-EM to image native full-length adult tau bound to microtubules with an overall resolution of 4.1 A?. They showed that tau attaches longitudinally along the crest of the tubulin filaments, a finding consistent with a previous low-resolution cryo-EM study. Tau is an intrinsically disordered protein that includes a projection domain, a microtubule-binding region of four imperfect sequence repeats, and a C-terminal domain. Tubulin is a dimer, which means a conjoined pair of closely related polypeptides, in this case α-tubulin and β-tubulin. The tubulin dimers get strung together (or polymerize) head-to-tail to form the protofilaments that make up microtubules. "Given extensive literature on its lack of regular structure, we weren't certain that tau would actually form ordered interactions with tubulin," said Elizabeth Kellogg, a postdoctoral researcher in Nogales' lab and co-first author on the paper presenting the work, published May 10 in the journal Science. To test hypotheses about which tau residues are involved in binding to tubulin, they then created synthetic tau constructs with microtubule-binding regions comprised of four identical repeats and imaged those attached to microtubules as well (overall resolution 3.2 – 3.9 Å). Simon Poepsel, a postdoctoral researcher in Nogales' lab, had worked with the amyloid form of tau as a graduate student and was instrumental in purifying and preparing the samples for cryo-EM. "When we were finally able to see the length of a tau repeat and see that it had a defined structure and binding site, we realized that tau was in fact forming specific interactions with the tubulin surface," Kellogg said. "When we were able to reconcile that with the length of a repeat and the sequence information we had, it was the key we needed to figure out how to improve the reconstructions sufficiently to enable atomic modeling." The team then turned to Rosetta, a comprehensive suite of computational modeling tools for predicting the three-dimensional atomic structures of macromolecules from amino acid sequence information, based on the conformation with the lowest energy state. The high-resolution cryo-EM maps allowed the team to put constraints on the overall shape of the molecular complex, increasing the fidelity of the model, Nogales explained. Frank DiMaio, an associate professor in department of biochemistry and the Institute for Protein Design at the University of Washington, contributed his expertise working with the Rosetta platform, particularly the "fit to density" function using cryo-EM data. Rosetta structure predictions for two different synthetic tau constructs converged on the same solution: a backbone stretch of 27 residues spanning three tubulin monomers. "The identical sequence register and atomic details from two independent maps underscores the robustness of our solution and provides high confidence in the accuracy of our atomic models," Nogales said. "Our structure shows how tau's main contact with the microtubule surface is at the interface between tubulin subunits, serving as a 'stapler' to promote the association between tubulin subunits and explaining how tau promotes microtubule stability," said Kellogg. "The structure also explains how tau phosphorylation leads to its dissociation from microtubules." Phosphorylation of the serine at position 262 (universally conserved among tau repeats) has been observed to attenuate microtubule binding and is a marker of Alzheimer's disease. The model shows that phosphorylation at this crucial anchor point would disrupt interaction between tau and the microtubule and thus cause the "staples to fall off". Additional residues that are critical for tau-microtubule binding were identified as well. Other contributors to the study were co-first author Nisreen Hejab, postdoctoral researcher in the Nogales Lab, and Kenneth Downing, a senior scientist in the MBIB Division, who served as Hejab's doctoral supervisor. This work was funded by National Institute of General Medical Sciences (NIHGMS) grants to Nogales via Berkeley Lab and to DiMaio, and by a Burroughs Wellcome Fund Collaborative Research Travel grant to Kellogg. This research made use of the unique resources of the Bay Area Cryo-EM Facility.